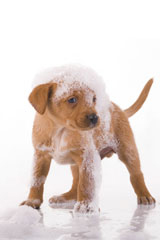 BATHING & GROOMING: Routine and therapeutic bathing services are available. We have a groomer on staff with over 20 years experience that can make even the ugliest dog look like a hometown show dog. BEHAVIOR COUNSELING: We can provide advice regarding the correction of problems such as excessive barking, chewing, spraying, scratching, digging, house soiling and aggression. BOARDING: We provide pet boarding as a service to our clients. All boarders receive personal attention from our caring staff. Please have all vaccines, heartworm tests & fecals up to date. Bring paperwork prior to dropping off with us, if we did not do the vaccines, so we can verify the updates. Pets may be dropped off and picked up during regular business hours Monday through Saturday. EMERGENCY CARE: We are equipped to handle most pet emergencies during normal business hours. After hours please call our main telephone number 239-774-6400 for instructions on after-hour emergencies. Emergency Pet Hospital phone number is 239-263-8010. Directions are linked under 'Contact Us' to the left. HURRICANE PREPAREDNESS: Please make sure you have a photo ID of your pet & you together, any medications your pet is on (get scripts if leaving town or refill plenty for travel & away time), all vaccination information or copy of medical records, a leash for dogs, carrier for cats, Microchip implanted with updated info registered (available @ EAC), plenty of food & bottled water for you AND your pet, and tranquilizers for anxious or nervous pets for travel or storm fears. INTERNAL MEDICINE CONSULTS: We offer medical referrals to an internal medicine specialist who performs ultrasounds, endoscopic procedures and helps us with the diagnosis of more complicated cases. PERMANENT IDENTIFICATION: We offer the Home Again microchip identification which is a tiny chip that is placed under the skin between the shoulder blades. It can be read via a handheld scanner that most Vets, Animal Control & Humane shelter officers have. PHARMACY: We maintain a complete inventory of pharmaceuticals, glucosamine supplements, vitamins, both cleaning or medicated shampoos, flea and tick control products and heartworm preventatives to meet the needs of your pet. We also carry a full line of prescription diets. RADIOLOGY SERVICES: Our on-site, modern X-ray equipment provides high quality radiographs to aid in the quick diagnosis of many disorders. Chest, abdomen, extremities, skull, and oral xrays available. SURGICAL SERVICES: Our state-of-the-art surgical suite provides for the performance of a wide variety of surgical procedures. We offer Laser Surgery that also speeds recovery & decrease damage to the tissue. It also reduces bleeding. See Frequently Asked Questions to the left.